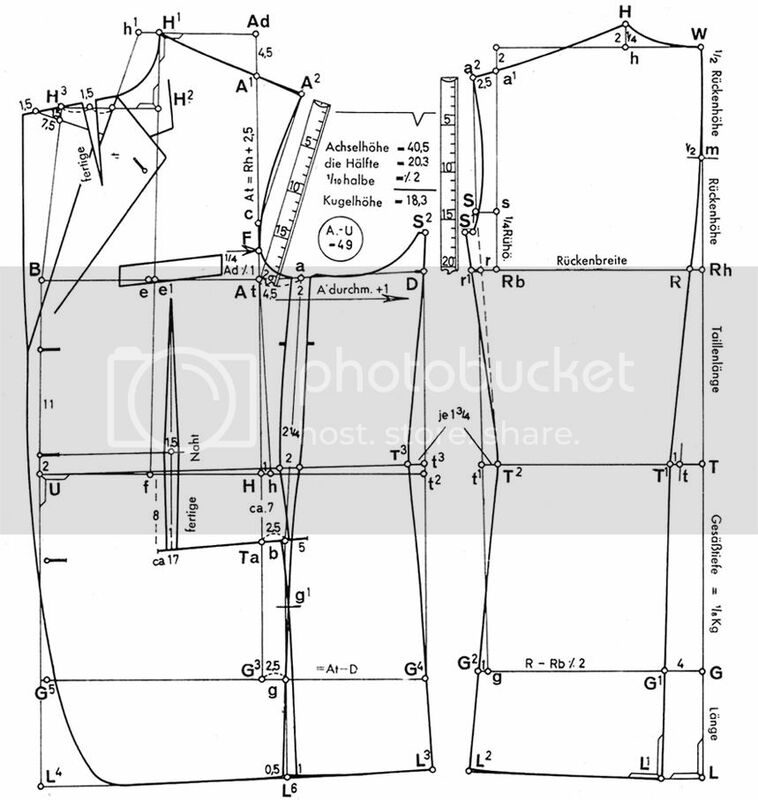 In Poulins book is a Armhole Depth Chart from Regal's American Garmnet Cutters of the American Gentleman Publishing Corp. Neither of these organizations are around anymore, so it is probably safe to put it out even though it is from a third party (Poulins book). the proportionate method will put the bottom of the armhole down by his waist. A direct measurement of some sort is neccessay or a good chart. The best cutters grab ideas from other cutter and develope their own systems. You are right, it’s could be easy grading needs that mess up systems probably. 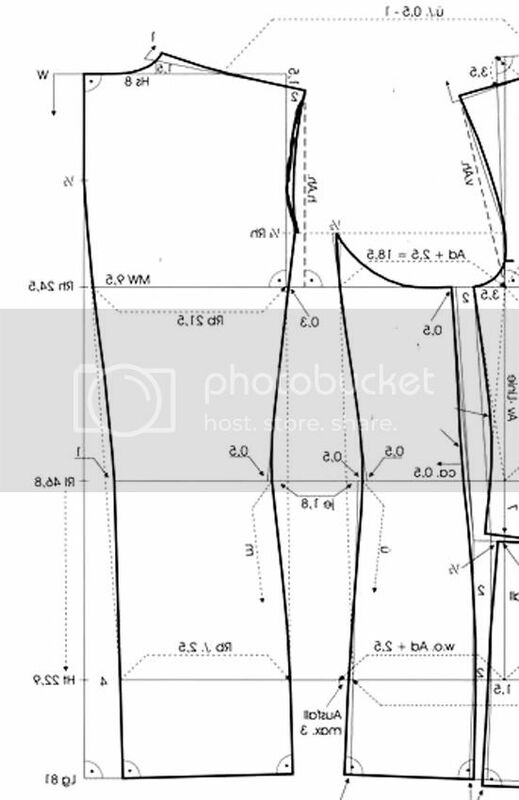 The operator of CAD have no clue what they do, the shapes of holes and hips are build in the system, the design engineer don’t know how a armhole looks like they have never learned esthetic formschoen. The principle of the Calculations from 2000 and 1954 are both right, though I find the one from 2000 looks rubbish. The armhole is always 1/8 Bu. + Konstruktionswert. But they put too much widths into the armhole stealing it from the chest. The skye depths can be a problem, with 26cm and Lockerung of 6.0cm is 4.5cm to deep. It is not in the proportion then. You need direct measurement + 2cm outmost. Probably you have straight Shoulders. I recommend for everybody to use the 1954 calculation method, it is a good method. When you measure the ‘kleine Seite’ you control the skye depth. Check “Schmidt - Zeitsparende Sakkofertigung” of Schneidergott in Forum it explains everything. Just for your interest, the following thread is based on the Müller and Sons/Rundschau circa 1960 book, Der Zuschnitt XVIth edition. I know that Der Zuschneider was interested in the XVIth Ed of that book. Also in that thread is a 1966 style adjustment of the system. It's pretty similar to the 1954 system save a few changes to fashion. Well, I guess jefferyD and jcsprowls might object. But in general you are right. I guess they make the armholes even deeper to accommodate more body shapes within the range of one basic size. 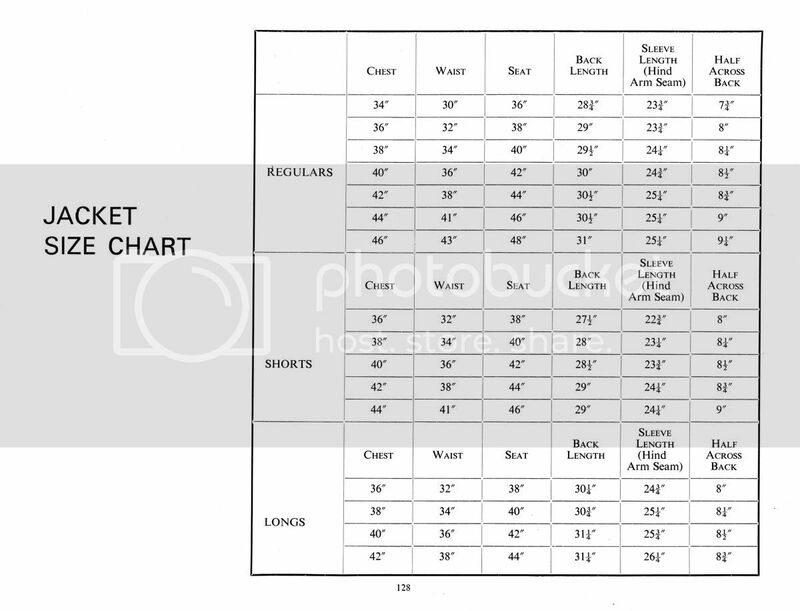 Based on this calculation the tall sizes get an even deeper armhole without any necessity. While your customers would like a smaller arnhole the factory may not be set up to make small armholes. That would be a similar scye depth to the Rundschau calculation. Here is a chart from the 60's, found in a Panaro cutting manual (Italian). The most scye depth is 26cm, no matter what size. In the 5th column you can find the 1/2 chest girth measurements (circonf. torace), in the eigth is the scye depth (profondita giro). Now you might say that there is no big difference to the Rundschau or Regal's system, though in fact there is a big one. In Rundschau they have a fixed shoulder slope of 2cm. No matter what size the draft is. I don't remember on who's blog it was, most likely on jefferyD's, where it was said that tiny armholes are more difficult to make in an RTW environment since it demands absolute precision. D is the bottom of the arnhole and not #4. Or, under A it would be C.
Deveers 1850-60 system, and everybody elses systems back then too, had about 2 1/2 inches of the back where connects to the sleeve. So all the rest of the sleeve connects to the front panel. Anyways, this is the whole draft. 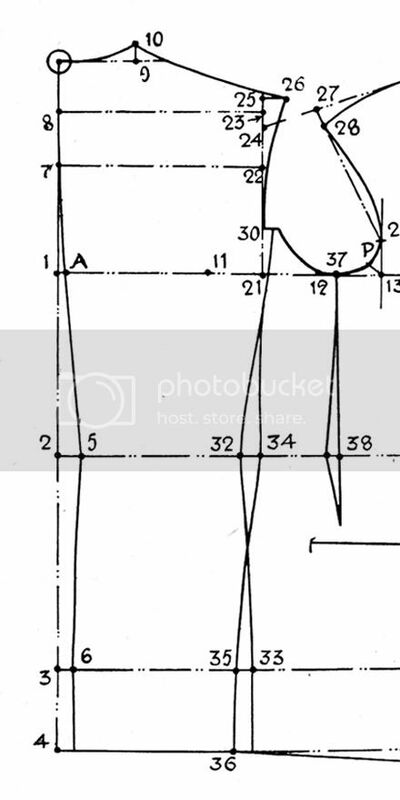 The blue line in the back indicates the scye depth (1/2 of (1/2) chest girth, in this case 48cm : 2 = 24. The shoulder slope is calculated 1/10 of 1/2 chest girth = 4,8cm, indicated by the red line. With a shoulder pad that amount would be only 3,8cm (approx.). I have been comparing RS and T&C drafting systems more of late and I have some more recent thoughts on making the modern RS cut more British, if that is what you want. Firstly, it is not uniquely British to have high shoulders. This is a variable that changes according to fashion in all nations. The Nutter shoulder was high, but the Whife shoulder was lower. Both are British. The formula does not change when you remove the seam allowance (note that the Rundschau Goes British draft in the opening post is nett without seams). This gives you a leaner chest and slimmer sleeves automatically. For a 98 cm chest the width of scye is 14.25 cm. The RS draft also shows a backwardly displaced head of side body - a feature that never made it into British cutting systems. This is something that is best used only where you wish to reduce the waist suppression at the front and replace it with a cleaner front that has the downside of looking a touch boxier. By eliminating the backward displacement, you gave more waist emphasis at the underarm seam, and a more waisted silhouette seen from the front. Note that I have also added in some flare of the skirt at the side seam. British drafts always have more flare here than most (but not all!) German ones. The same thing should be done at the side seam of the back panel. As you can see on a 38" chest, the fashion waist will be about 42.9 cm long. 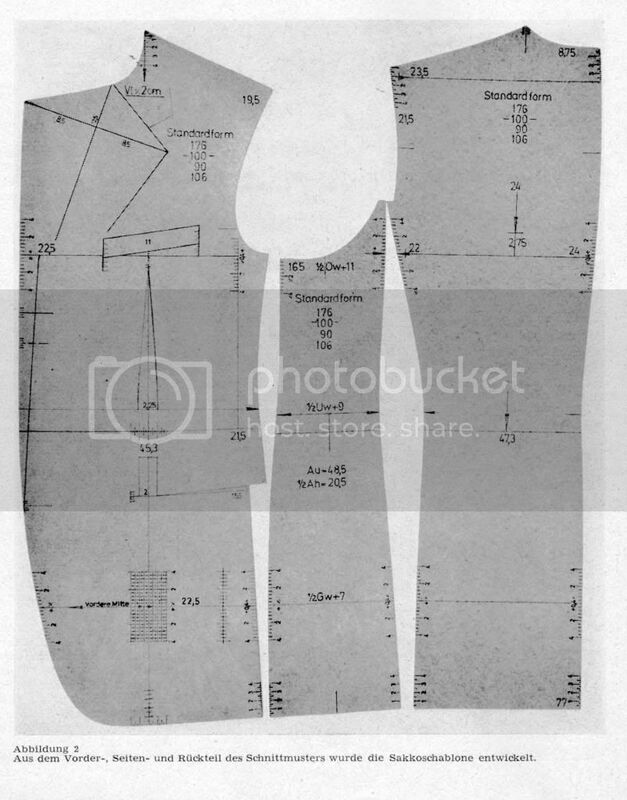 This is dramatically shorter than the 46.8 cm fashion waist for a 98 cm chest that is proposed to be "British" by Rundschau! Again this is something that differs according to fashion and taste. However, in actual fact if you look at the Chaudhry 1970 T&C table, you will see that the length for a 98 cm/38 1/2" chest would be more like 77.5 cm, which is significantly shorter than 81 cm. This is about right - 21 cm nett. However, since the width of scye has been narrowed, you can add a bit of back drape by widening the across back by about 1.25 cm or 1/2". The amount of overlap on British drafts is even greater than what is shown here - 7.5 cm without seams. British drafts usually show about 3 1/2 - 4" with 1/4" seams ie about 8.25 - 10 cm nett. The natural waist (Rückenlänge) depends on a persons height and is usually varied by +/- 1 cm, at least in German systems (1/4 of body height (head to toe) +/- the 1 cm). The body height normally used in Germany for such calculations is around 180 cm, again +/- 2 cm, so the waist depth is around 45 cm. And I don't think there is a need to flare the skirt a bit more at the side seam. The waist has been taken in a bit more there already, so the more tapered look in general will make the hem kick out a bit more. Plus it's a feature that is not very common over here so people are not used to it (except for riding garments). Coats in the 70's and also in the early 80's were significantly shorter here in Germany, too. I also think that a longer, slimmer cut coat enhances the (slim) figure of the wearer. It also depends on where you consider the waist to be on the body. When an Italian tailor showed me, it was much higher than what I would have intuitively thought. The waist also varies greatly according to fashion. However, the proportionate waist is much longer by the RS system than by the T&C system. Shortening the fashion waist in this instance would be good to make the draft more genuinely British and to emphasise the waist - one of the stated goals of the style. Unless you have these authentic British features, the draft ends up being a caricature that is about as British as zuppa Inglese. Well I guess compared to the boxy coats you usually see in the shops the "Britisch Linie" coat would be very, very British, indeed! The German fashion waist usually sits around the 1/4 of body height calculation. In the 70's the slender looking appearance was gained by adding a hollowed seam above the actual waist line at the front seams. Something that is hardly possible with a standard RS draft of today. I deliberately tried to make my modifications to the RS-Goes-British draft look a little more like this. Notice how on this one the flare is added to the skirt at the side seam. They add so much flare that even after leaving a 2 cm gap at the top of the side seam (an innovation to help the side body overlapping the fronts), the underarm seams still overlap about 1.5 cm at the hem! There is also a bit of flare at the side seam of the back panel. This is what I meant when I said not all German drafts have narrow skirts. It just goes to show you cannot generalise. However, you never see such skirtiness on RS drafts after the 1960s. The above draft is unique, and I like it great deal. The draft is from 1966, 17. edition. There was a new style of having flare in the skirt like 10cm instead of 7cm. The draft has good flare. The only mistake is the 2cm side dart which messes the waist supression up from the front. They figured that out in a later Rundschau of 1966. Also the additional pinching of the hem made things worst. Like SG says the waist moved up by hollowed seams beginning in the 70thies. Rundschau got British then, to get out of the potatoe sacks. ADM = 1/8 Bu. + 4.0 including seams depends on your muscles of the arm. ^ The English translation of the above post is that the above Rundschau Zuschnitt XVII draft for waist emphasis dates from 1966. The "2 cm" refers to the gap placed between the front panel and side body at point "a". I am unsure about the term "side arm" (since Seitenarm is not a German word either), but suspect it means a "side body" and he is trying to say that this pattern has a backwardly angled head of side body, which inhibits the waist suppression at the underarm seam. I am not sure what the "pinching of the hem" means but it is probably a cryptic reference to the way a small Donlon wedge was introduced into the pattern back in the 1960s even for proportionate figures. ADM is an East German abbreviation otherwise known as the DG or il diametro di giro (armscye diameter). BU is a German abbreviation otherwise known as the MT or la misura di torace (chest measure). I should add that the above 1966 Waist Emphasis draft is extremely unusual for a Rundschau draft. It is banished to an obscure part of the Zuschnitt XVII book which makes it hard to find. It was almost as though they were embarrassed by it. It makes a fleeting appearance and then is never seen again, for after that they are back to the usual long waisted drafts with ever increasing backward angulation of the head of side body, and reduction in the skirt flare rather than an increase. The long fashion waist length continues to be a feature of the RS system right up to the present day. So it is far from representing a new direction for the Rundschau system. As for the angled back head of side body, the waist suppression increases on this draft from the 2 cm gap at the top (between front and side body) to 2.25 cm at the fashion waist line (which is displaced on the forepart 2 cm above the natural waistline), resulting in a hollowing at the waistline of the side body front edge. The side body has flare added to the hem as well. These factors makes this side body hard to compare with current day Rundschau side bodies, where the backward angulation causes the side body front edge to bulge outwards at the waistline rather than being hollowed out here. A side to side comparison suggests that the amount of backward angulation of the side body in the above draft is quite minimal. I think the Rundschau pattern we have in (world) wide use now is from the late 80's and has slowly been transformed into the easy to deal with by computer systems pattern we have today. From a RTW manufacturing process point of view I'd go as far as to say that the 1954 version had some advantages. The shape was already in the cut, which makes it easier to assemble the single parts. In 1954 the seams had almost the same shape so they could have been sewn together much faster. The latest draft shows different shapes of the seams, so there is room for "interpretations" by the poorly trained operators! They have the tendency to ignore the matching notches which are meant to be a guide during the process of sewing! 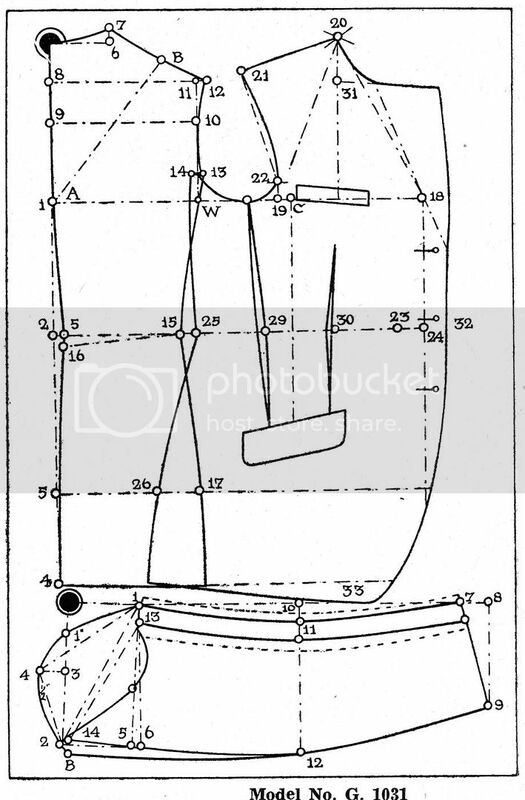 Schneidergott, some years ago in a russian magazine for tailors was exactly the same article of thet German tailor. Its processing technology of canvas I use. In other words, the idea behind the front dart is not so much to make the waist narrower (ie reduce the circumference at waist) but to give the front panel more shape at the waist. The difference is subtle but real. Actually it's not about waist supression all the time like people would wish and love so badly dreaming day and night of an English SR female hip swinging suit LOL, its about bringing chest in the front not only waist. Still the chest is not enough, you apply the lapel dart from 1 - 1.5cm. Edited by Der Zuschneider, 10 April 2012 - 08:39 AM. You really need to lift up the waist 3cm in the front like in the pic. Otherwise you cannot get style into the suit. The fronts need to be looking slim and long and the fabric stripe need to fall a tiny bit to the outside not to the inside to make the fronts appearing even longer plus you need to cut the fronts 1cm longer than the back. Anything looks boxy like in the 50 - 60thies and has not style. This was the time with no style, the boredom of the suits. And throw away any nasty Schraegstellung and of the side dart in the Mueller books for proportional figures which makes the side seam short. Also the shape of the sided art is completely drafted wrong and boxy boring.